Mark Your Girl Scout Calendar: Girl Scout Week is March 9 -15! Each year, on March 12th, Girl Scouts across the country celebrate Girl Scouts' Birthday, commemorating the day on which Juliette Gordon Low officially registered the organization's first 18 girl members in Savannah, Georgia. Girl Scout Week is celebrated each March, starting with Girl Scout Sunday and ending with Girl Scout Sabbath on Saturday, and it always includes the Girl Scout Birthday, March 12. During the week, we hope everyone will show their Girl Scout pride by participating in activities on GSNC’s Girl Scout Week Calendar. Also during Girl Scout Week, GSNC is hosting the new and exciting program, Women of the World at Orchard Hill. Portrayed by the GSNC Theatri-Gals, Juliette Gordon Low and her famous Girl Scout guests will welcome you to Orchard Hill, the beautiful 19th century home of the Phipps family. You’ll meet and mingle with guests as you learn more about their contributions to their fields. The Resource Room has program materials to help your Troop celebrate GSUSA's 102nd Birthday! Have fun with the Juliette Low Action Story, Juliette Low Kim's Game, or step back in time with the The Golden Eaglet (DVD), Celebrate Girl Scout Birthday this year with a special ceremony, music or craft. Girl Scout Day at Friendly's! Celebrate Girl Scouts Birthday, March 12, 2014 at Friendly’s Restaurants. Dine at your local Friendly’s, and share great food and memorable times in support of the Girl Scouts of Nassau County. Bring your family or friends and 15% of your total bill will be donated to Girl Scouts of Nassau County with the Girl Scout Day at Friendly’s flyer is presented. Multiple Locations to Choose From! Girl Scout Day at Chili's! Celebrate Girl Scouts Birthday on March 12 at Chili’s Restaurants. Let Chili's do the cooking while supporting Girl Scouts of Nassau County at the same time. With each flyer presented on Wednesday March 12, 2014 Chili's will donate 15% of the event day sales back to GSNC, so gather your family and friends and celebrate Girl Scouts Birthday at Chili’s! Last week, we celebrated President's Day by honoring our former Presidents. We would like to also acknowledge the women who gave them the support they needed to help them succeed and make such a great impact on the world we live today. Martha Dandridge Custis Washington, better known as “Lady Washington,” was the wife of George Washington, the first President of the United States of America. She was born on June 12, 1731 and died on May 22, 1802. She became a widow at the age of 25 and was left with four children. Upon marrying Washington, she brought her personal wealth to the marriage which allowed Washington to add land to his personal estate. She was the First Lady of the United States from April 30, 1789- March 4, 1797. Martha is remembered as being fashionably dressed, assertive, and an independent woman of great wealth. She traveled thousands of miles to be with her husband because she supported the cause of freedom as well as to show her loyalty to her husband and inspire the troops. In her honor, the U.S. Navy named transportation systems the USS Lady Washington and the USS Martha Washington. Martha Washington was also honored in history with U.S. postage stamps, paper currency and coins. Mary Todd Lincoln was the wife of Abraham Lincoln, the sixteenth President of the United States of America. She was the First Lady from March 4, 1861 until April 15, 1865. One of seven children from a wealthy family, she grew up to become very well educated. Through her education, she learned to speak French fluently and she studied music, drama, dance, grammar, geography, literature, and social etiquette. During her marriage, she had four children. Mary supported her husband throughout his presidency socially and politically. While he was away, she spent her time raising their children and maintaining their household. When she did spend her time assisting her husband, she was a volunteer nurse in the Union hospitals, offered her knowledge and own personal advice to her husband on military personnel, and toured Union Army camps. Sharing this information with your troops during a meeting or even during snack time can help to inspire them to grow into leaders and think about what it means to be a leader. How do you think it would feel to be a First Lady? What would be your goals if you were the First Lady of the United States of America? Would you rather be the President or his wife? When there finally is a woman elected President, what do you think that first husband will be expected to do? First Lady Biography: Martha Washington. n.d. February 2014. .
First Lady Biography: Mary Lincoln. n.d. . When I “think” about World Thinking Day for Girl Scouts, it is kind of overwhelming. How can you think about all the Girl Scouts and Girl Guides all over the world? “Mama” Edith Katz, Nancy LeGloach, and Nina Pesci for many years served as the hosts for literally hundreds of girls over dozens of years who came from around the world to participate in international opportunities and events. The girls would enter thru various NY airports and Mrs. Katz, Mrs. LeGloach and Mrs. Pesci were in charge of matching them with Girl Scout families in Nassau who opened their homes to these young travelers for their first few days in the USA, send them off to their GSUSA assignments, and then welcomed them back at the end of their journeys for a few more days of fun and celebration, before they returned to their homes. Memories were made and I know that some of these girls have stayed in touch with their host families for many years. I remember the four girls and their adult chaperone from El Salvador who came to visit us in 2002. My family had the privilege to host them in our home for a week. I still stay in touch with these girls through the magic of Facebook! We welcome you to share your international experiences with us! Presidents’ Day is an American holiday that honors and celebrates all US Presidents both past and present. It was established in 1885 as a day to recognize President George Washington and was traditionally celebrated on February 22 (George Washington’s Birthday). Today, we celebrate Presidents’ Day on the third Monday of February, honoring not only George Washington, but all Presidents. In honor of Presidents' Day (it’s today), we have listed a bunch of facts about two of the four United States Presidents who were born in the month of February—President George Washington and President Abraham Lincoln. Your goal is to match the fact to the President. This President was the 1st President of the United States. This President was the 16th President of the United States. This President signed the Emancipation Proclamation. This President fought in the American Revolution. This President was known as the “father of his country”. This President was known to be an excellent dancer. This President had the nickname of “Honest Abe”. This President was married to Martha. This President was the first man to sign the United States Constitution. This President was married to Mary Todd. This President can be found on a US One Dollar Bill. This President can be found on a US Five Dollar Bill. This President was one of the original creators of the Secret Service. This President never lived in the White House. This President is considered one of the tallest American Presidents, standing at 6 foot 4 inches tall. This President was born on February 12, 1809. This President was born on February 22, 1732. 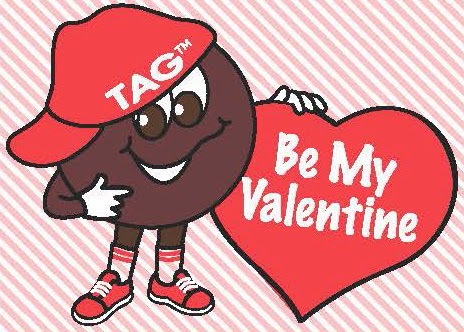 So, Valentine’s Day is this Friday (2/14) and you are trying to come up with something cute, simple and unique for your Girl Scouts (or maybe yourself) to give to a Valentine. 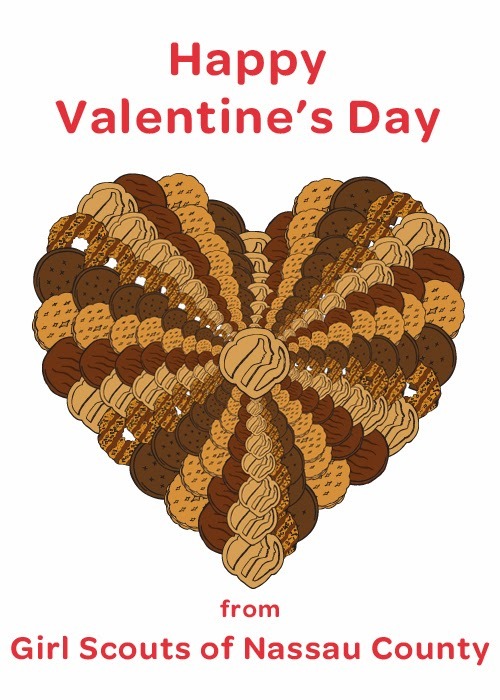 Well as Girl Scouts in the midst of Girl Scout Cookie Season, we are inclined to come up with some Valentine’s Day Gift Ideas that involve Girl Scout Cookies. Here is our Idea: Some Sweets for Your Sweet… using Girl Scout Cookies! Last Monday, when the GSNC Office was closed for a snow day, we were busy at home in the kitchen baking, trying some of those Girl Scout Cookie recipes that you can find on Little Brownie Bakers website or on Pinterest. We narrowed down the recipes to two that definitely were the office favorites. Just like a Thin Mint, Little Brownie Bakers came up with a chocolaty, minty recipe that is really simple and easy for girls to make. Before you begin making your Thin Mint Brownies, take 1 sleeve of Thin Mints and put them in the freezer for a little while (this way they are easier to break up later on). Now, to get started on the recipe… Take a box of your favorite brownie mix, 2 eggs (3 if your prefer cake-like brownies, ¼ cup of water, ½ cup of vegetable oil and 1 sleeve of crushed Thin Mints Girl Scout Cookies and mix all the ingredients together into a mixing bowl using a wooden spoon or a whisk. Note, the batter will have some chunks of Thin Mint Cookies, this is okay. Put the batter into a greased baking pan. Bake the brownies at 350 degrees. The timing depends on the size of the baking dish you use, so take a look at the back of your brownie mix box for the baking time estimate. These Mini Cheesecakes don’t have to only be made with a Samoa Girl Scout Cookies; they can be made with your favorite type of Girl Scout Cookie. We found the recipe for Mini Girl Scout Cookie Cheesecakes on the blog Sugar Derby. The recipe makes roughly 18 mini cheesecakes by using cupcake pans. First, you place cupcake liners into the cupcake pan. Then place your favorite type of Girl Scout Cookie in the bottom of each cup cake liner. Then place the cheesecake filling on top of the cupcakes. We used Sugar Derby’s Cheesecake Filling recipe and it was delish, but if you have your own cheesecake filling that you prefer, you could probably use that recipe too. Thanks Sugar Derby for a great treat! Please know Girl Scouts of Nassau County has no affiliation with the blog Sugar Derby other than we found a recipe of theirs on Pinterest and thought it looked tasty and was worth a try. Interviewing Barrington Irving by Caeley L.